Lena is 25 years old and was born with a heart defect and Down syndrome. Her back is not strong, making it difficult to move around independently. However, that does not stop her from cheerleading, which is a very big part of her life. She was the first person in Rockingham County to cheerlead while being in a chair, and she cheered also with the JMU cheer squad. While doing all of this, Lena also was a part of an article included in the Chicken Noodle Soup for the Soul book series. We are celebrating Lena for her amazing accomplishment of recently losing 28 pounds through healthy eating and exercise! Lena has been part of JMU’s Overcoming Barriers program since it started in 2010, where she has participated in a number of physical activity and cooking programs. It has provided an amazing outlet to exercise and learn about healthy eating. 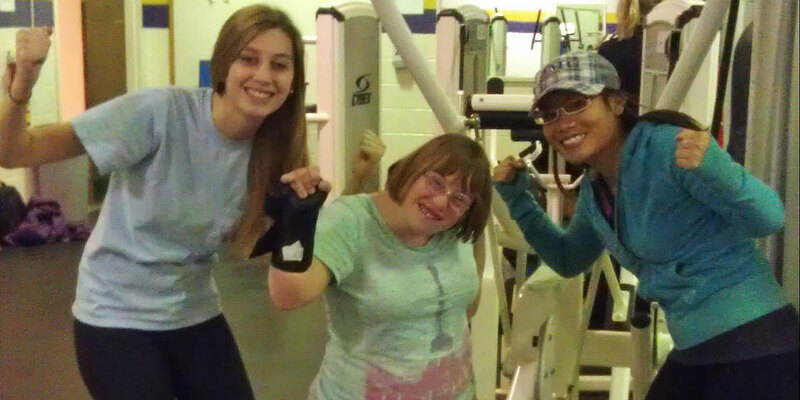 Her favorite thing about Overcoming Barriers is working out. Lena’s back has gotten stronger, and it been easier for Lena to move around on her own. Overcoming Barriers’ cooking program also taught Lena some great culinary skills that she now uses to prepare meals at home. She learned about portion control and now encourages her family to make healthy choices as well. Lena’s goals for joining Overcoming Barriers were to socialize, have an activity to do, and increase her movement. She far exceeded her goals! Losing 28 pounds impacted Lena by improving her heart condition, increasing her movement, helping her to find clothes that fit and that she enjoyed more, and overall helping her to feel a lot better.